Megan has day-to-day responsibility for our work with Welsh Government Ministers. Her research interests centre on the internal workings of national governments, public management and leadership; she is currently completing a PhD on sensemaking and leadership in government. Megan began her professional career in management consultancy, for PA Consulting Group and Serco. Between 1997 and 2005, she delivered successful client assignments for governments in the UK and USA, before becoming a director of Serco’s in-house think tank, The Serco Institute. In 2006, Megan was approached to join the UK civil service as an interim Senior Civil Servant, working on public service reform and innovations in governance for the devolved Welsh Government. In 2010 she then co-founded and ran an independent action research team, Kafka Brigade UK and Ireland – supporting the public sector to radically redesign and innovate services around the citizen. Between 2013 and 2017, Megan lived and worked in the Middle East. 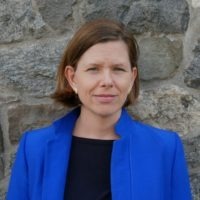 She continued as an Associate for the Kafka Brigade, before taking a role in 2014 as a Senior Advisor for the New Zealand Government in the UAE, and then in 2015, joining the Mohammed bin Rashid School of Government in Dubai as a Research Fellow, specialising in public management and leadership. Until her move to the Gulf, Megan also held advisory roles with Wales Public Services 2025 (a think-tank initiative she co-founded), SPICE (a time-banking social enterprise), the Equality and Human Rights Commission in Wales, and the Institute for Welsh Affairs, chairing its Cardiff and Valleys Branch (think-tank). She is a Friend of the Royal Society of Arts (FRSA).